A letter has been issued by the Archbishops of Westminster, Cardiff, Southwark, Birmingham and Liverpool on behalf of the Catholic Bishops’ Conference of England and Wales on the topic of the forthcoming election and our duty as Catholics to take part..
“As we approach the General Election on 8 June, we offer you these considerations. These words encourage us to approach this General Election with a positive determination to consider carefully all that is at stake. An important duty of every UK citizen with the right to vote is to take part in this General Election. Please make sure that you are registered. Please do vote. Your vote is a matter of conscience. It is your judgement about all that God wants of us, both personally and as a society. To do this we must name and face every injustice and exploitation which scars our society and world. The family is the basic model by which we think of humanity, for the family is indeed the fundamental unit of the human race and therefore to be protected and nurtured. The practical expression of this love is mercy, and compassion, extended especially at times of illness, homelessness, bereavement, violence and desolation. We cannot be indifferent to the struggles and disasters of people who live far away from us, and must strive to assist and protect them. We cannot be indifferent to the environmental impact of how we live and organise our creation of wealth and well-being. Here we insist that every person has a shared dignity that should never be denied or ignored. We are made in God’s image and likeness, precious to him and each other, and this must be respected and valued. These broad principles impact directly on many of the practical issues being debated at this time. Indeed, this General Election takes place at a pivotal moment in the life of our nations as we prepare to leave the European Union. To a great extent the outcome of this election will determine the approach taken on how this is achieved, the priorities we pursue and the values we wish to treasure as our own in the UK and as partners with countries around the world. It will determine how we can heal divisions in our society, care for the vulnerable, how our public services are run and whether we can remain a united kingdom. These principles shape our thinking about the issues that are being debated at this time. Attached are some questions you might consider yourselves and raise with candidates or those who seek your support. There are over three million EU citizens living in the UK and about a million British citizens living elsewhere in the EU. They face an uncertain future. Where do your candidates stand on the future of EU citizens in the UK and reciprocal rights for UK citizens in the EU? As our formal leaving of the EU approaches, new trade deals will be negotiated. It is important that in them human and workers’ rights, the environment, and the development of the world’s poorest countries are taken into account. What issues do your candidates think should be the top priority when forming new international partnerships? In 2015 Parliament voted overwhelmingly to protect society’s most vulnerable people, by preventing the legalisation of assisted dying. Will your candidates uphold this decision? Will they support measures to promote the intrinsic value of life at every stage? The family is at the heart of the health and well-being of society, above all the well-being of children. What policies do your candidates propose for the flourishing of family life? In a civilised society prisons should be places of redemption and rehabilitation. Our prison system faces unprecedented levels of violence and suicide. Do your candidates support urgent prison reform and better resourcing? The UK has long been a place of welcome for people from other countries. There needs to be a clear policy on migration, which works for the economy and is respectful of the unity of marriage and family life. How will your candidates ensure that we operate a fair migration system for people wanting to enter and work in the UK? The UK is currently committed to resettling at least 20,000 of the most vulnerable Syrian refugees by 2020. Will your candidates work to ensure that this commitment is kept and options to expand the scheme are considered? Will they promote a welcoming society and stand against hate crime? Across the world millions of people are persecuted because of their beliefs. How do your candidates intend to promote freedom of religion or belief for all, and what steps could be taken as a priority in UK foreign policy to protect religious minorities, including Christian minorities? Aid provided by the UK saves lives and helps people out of poverty. Will your candidates commit to protecting and enhancing the international development budget? There are many in our communities who are financially vulnerable and struggle to make ends meet or in need of decent housing. Where do your candidates stand on helping the poorest, in terms of health, social care and housing? How will they support people with mental health problems? How will they finance these services? Catholic schools make a positive contribution to society, serving over 845,000 children in England and Wales. Will your candidates support parental choice for the education of their children? Will they support Catholic schools as part of this choice for faith-based education? Modern slavery is a gross violation of human dignity affecting at least 14,000 people in the UK and millions more around the world. How will your candidate give political support to the fight against modern slavery and better assistance for its victims? There are many other issues you will be considering. In all of them please bear in mind not only their impact on you and your family but also their impact on our wider world. The UK has a long and worthy tradition of generosity and justice. The values contained in these questions are fundamental to our way of life and the good of our society. and building a society based on justice and peace. 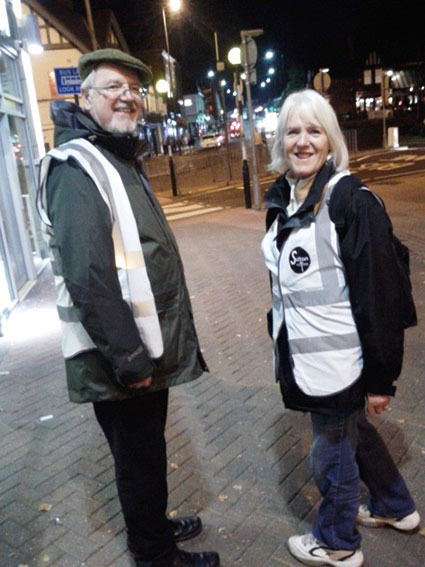 You may have seen a previous blog about Sutton Pastors – the Street Pastors that help keep the streets safe for those vulnerable after partying, and those who have been partying and find themselves in some sort of a crisis. If not, check it out – not least because they are looking for volunteers! 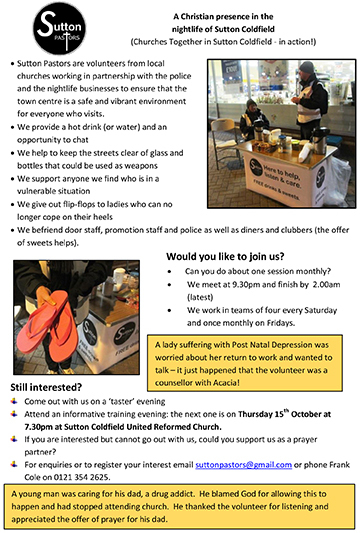 And because there there is an information meeting on Thursday 15th October at 7.30pm at Sutton Coldfield United Reformed Church. Since that blog I’ve been out with one of the Pastor Teams. It was cold, very cold, and I am not a night owl, but it was a fascinating evening in all sorts of ways. It was touching too to see how warmly party goers and bouncers alike responded to these team of people doing good simply for the sake of doing good. A number of people who had just come and said ‘hello’ but their offer was politely declined: the team was there to offer themselves and their care, and that was enough. 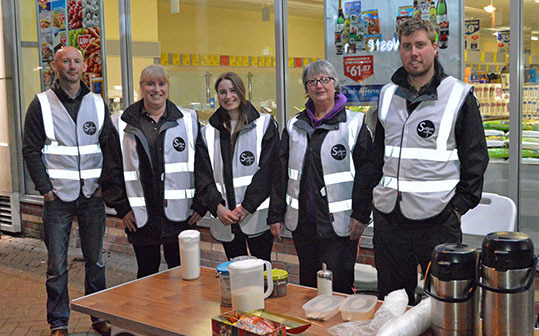 The volunteers offered a kindly word or greeting, and tea or coffee of hot chocolate for those who needed or wanted; and they offered sweets (very popular with the bouncers and the police!). They also offered flip-flops to those who had come out in stiletto heels and could no longer safely manage them. Sometimes, if someone is the worse for wear, and especially if they have been abandoned by friends the volunteers will help them get a cab home. Appreciated by the police, because the volunteers help pick up abandoned bottles or glasses left in the street (preventing them being used should any fight start) and because they offer friendship and care to people in need. 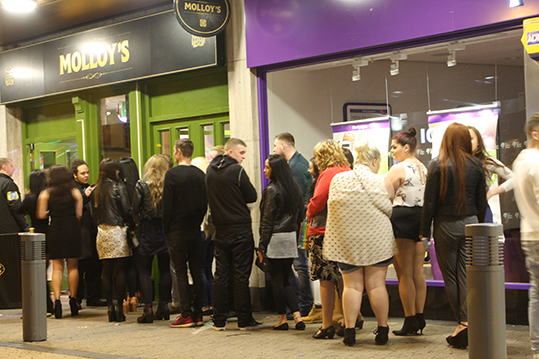 I found it a very interesting night – challenging some of my prejudices, and raising all sorts of questions about how else we might reach out to those who may not readily come along to Church on a Sunday without just such encounters as happen between Pub and Club in Sutton town centre on a Saturday night.